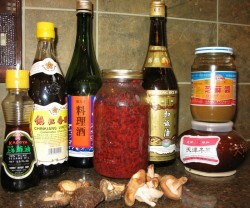 The last category of umami ingredients from Asia contains what at first appears to be a disparate group of food items: wine, kimchee, pickled and preserved vegetables, mushrooms, rice and vinegar. Believe it or not, all of these items have characteristics in common–they all involve fungi or bacteria in some way, shape or form. There are grape wines produced in China, but by far, the most popular wines are produced from rice. Shao Hsing is one of the most famous of these sometimes potent beverages, and with good reason: a very good Shao Hsing tastes better than the best sherry. It is rounded, full-bodied, crisp, with a rich, sweet finish. Like the fortified wines of Europe, such as sherry and madeira, it gains even more character and flavor when aged; not surprisingly the amount of umami flavor also increases with age. There is a particularly Chinese ingredient that is worth mentioning: red yeast rice. It is whole grain red rice (the outer rice bran is deep reddish brown in color), which has been fermented by the specific yeast strain Monascus purpureus, which results in a the brilliantly red-colored fermented rice you see in the mason jar in the center of the illustration. This preparation has been used as a food, flavor enhancer and medicine in China for centuries, and recent scientific investigation in the West has shown it to be beneficial in controlling high cholesterol levels in the blood. Currently, the FDA has red yeast rice classified as a dietary supplement, but there is apparently discussion of classifying it as a prescription medication. The flavor of the rice, however, is of most interest to me; it is complex, deep and rather earthy–all qualities that point to the high levels of umami present in it. I like using it in simmered dishes, like red cooked beef or soy sauce chicken. From fermented grain, we go to mushrooms. Instead of being flavored by the action of fungus, mushrooms themselves are fungus, and in general, the darker the mushroom, the stronger the umami content. In addition to that general rule, dried mushrooms are more flavorful than fresh; this explains why the Chinese black mushroom features in so many Chinese dishes. Not only do these dried shiitake mushrooms keep forever in a dried state, when they are rehydrated, they never take up as much water as they originally held, so their texture is transformed from soft to toothsome and chewy. In addition, the water or wine you use to soak the mushrooms for their rehydration bath, is deeply colored and flavored with the umami-rich essence of mushrooms. I never waste this liquid; always it is poured into a simmer soup or stew, or is used as the basis of a sauce. Fresh shiitake are also filled with glutamate, but are not as strongly flavored. However, the tender texture of them is interesting, so combining the two mushrooms in a single dish leads to a double shot of umami along with interesting variations in texture. Fermentation is not always caused by the action of yeast feeding on sugar and reproducing to create alcohol. There is a second kind of fermentation, known as bacterial fermentation, where beneficial bacteria, typically lactobacillus converts simple sugars into llactic acid. Such fermentation is nearly always used as a preservative agent for a staple vegetable such as cabbages for winter; however, the side benefit is that it enhances flavor and adds nutritive value to the food. Lactic acid and living lactobacillus cultures are beneficial to the human digestive system, and foods loaded with these are considered tonic or medicinal by traditional medical practitioners, a view which is supported by scientific research. Kimchee is used both as a side dish or condiment on its own, but also as an ingredient in long-simmered meat dishes, like this one for kimchee jij-gae. I am also fond of kimchee in ramen. While kimchee may be the most famous and varied example of Asian lactobacillus-fermented vegetables, Sichuan preserved vegetable deserves to be just as well known. Used in various recipes of that region as a distinct bearer of flavor and nutrition, I like to pair it with dried shrimp–another umami ingredient–in the justifiable famous dry fried green beans. While the English name sounds quite vague, the Chinese name, zha cai, according to Fuchsia Dunlop, refers to mustard tubers that have a crisp texture and a salty, sour and spicy flavor. You can rinse the vegetable off before using it, but I like to use it as is and use less soy sauce and salt when I cook with it, because I like the sharpness that the chile brings to the flavor, and if you wash the salt off, most of the chile is removed as well. Vinegar, such as the aged, black rice Chianking vinegar, is filled with umami in addition to being sour from dilute acetic acid . Another food produced by bacterial fermentation, vinegars can be the result of direct bacterial fermentation of grain or fruit, or they can be produced by a secondary bacterial fermentation of a yeast-fermented alcohol, such as grape wine or rice wine. Rice vinegar and chianking vinegar give the tart flavor to various Chinese dishes, including chicken with garlic sauce, and the classic Hunan-Sichuan (both regions claim origin rights to it) dish, Gong Bao Jiding–Kung Pao Chicken. Finally, I included in the photograph of this group of ingredients two Asian condiments that are not specifically noted as being bearers of umami taste, but which I think combine beautifully to enhance the existing umani in any ingredient or dish. Sesame paste, which is made from untoasted sesame seeds, ground together, is used as a dressing for a Sichuan dish of cold noodles. It has a light nutty flavor that is like peanut butter, but not as sweet or bold, and to my palate, combines beautifully with preserved vegetables, because the acidity of the vegetables cuts the richness of the sesame paste, while the paste heightens the umami brilliance of the vegetables. Sesame oil, pressed from toasted sesame seeds, really enhances the umami flavor of any dish that includes chicken, black mushrooms or fermented black beans. Just a few drops, drizzled over the dish at the end of cooking (always add it at the end–it has a low smoking point and will burn otherwise) brings out the very meaty, savory quality of these ingredients. Always remember, however, that toasted sesame oil is meant to be used in minute amounts and as a condiment, not a cooking oil. It is very strongly flavored with a very browned, nutty flavor that becomes overwhelming and unpleasantly sharp when used in too large of an amount. It can easily mask other flavors if used injudiciously, but when used properly, it can make all the other ingredients in a dish jump up and sing each of their distinct notes in a chorus of perfect harmony. In my next installment, look for a dish loaded with umami ingredients, conceived of and cooked by Morganna independent of my interference. It turned out beautifully, and I thought it was a perfectly wonderful coincidence that she wanted to cook a dish filled with Chinese umami ingredients just as I was starting this series. Even if she -did- catch a side towel on fire! OH, my jar of rice is sooo photogenic!!! So, should I put you down for another batch after I get done with making the next run of my ricewine? Hey, I was very calm about putting it out and it isn’t like i MENT to set the side towel on fire…. It was an accident, I swear! Dyslexia makes for very amusing spelling, dear one. And I know you didn’t mean to set it on fire. I forgot red vinegar! Thank you for mentioning it, Shirley–there really are so many such ingredients in Asian foods that it is hard to keep track of them all. Ginger and sesame oil together is a magic combination, though, isn’t it? You are absolutely right, Scott–I missed those! Probably because I haven’t a lot of experience with them–but I should have mentioned them. I know that they tend to be used on toast–are they ever used as ingredients in cooking, I wonder? Thank you for pointing that out to me. The Marmite FAQ says, “A teaspoon of Marmite can also be added to soups, casseroles, and almost any savory food for a wonderful, rich flavoring.” (I have also heard terms like “savory meatiness” used, a pretty good sign of umami.) Vegemite could be used the same way, but it seems to be easier to acquire Marmite than Vegemite in the US (certainly the case here in West Michigan). _Wild Fermentation_ has a recipe for wine dregs soup, which would work along similar lines. The spent yeast from my wine/ale fermenters upsets my stomach, though, so I don’t see myself enriching soup stock with it anytime soon. I am not surprised that Marmite can be used that way–as I recall, vegetarian folks use nutritional yeast to add flavor to various dishes. In fact, the umami thing is most certainly the explanation behind the vegan propensity for using miso in all sorts of recipes that have nothing to do with Japanese cuisine. When I was younger, I eschewed such practices, but when I started cooking for vegans as a living, I unbent a good bit and realized that miso added a lot of flavor that would otherwise go missing in vegan foods.